Enforce a minimum order amount, by adding a surcharge to any order which does not reach the specified minimum order amount. 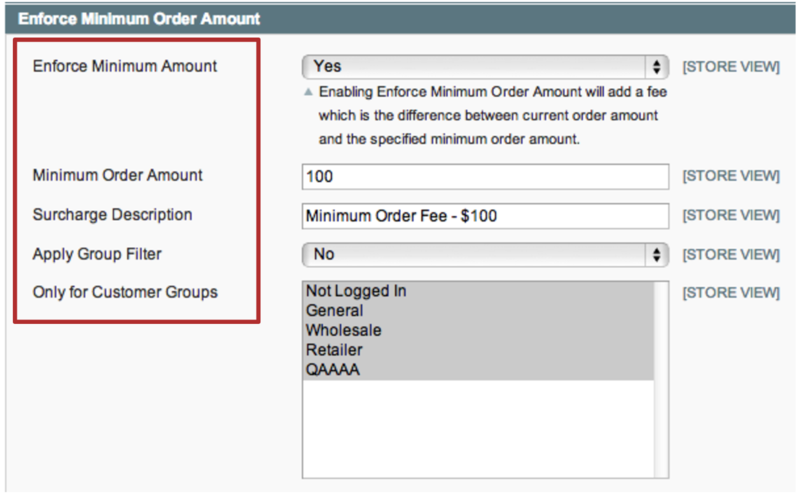 Important: This feature is incompatible with the standard Magento “Minimum Order Amount” feature. You should not use both features together. When set to Yes, a minimum order surcharge will be enforced. Enter the minimum amount an order has to reach. The surcharge will be applied to any order below this amount. Enter the surcharge description that will be visible to the customer – eg. “Minimum Order Fee - $100”.